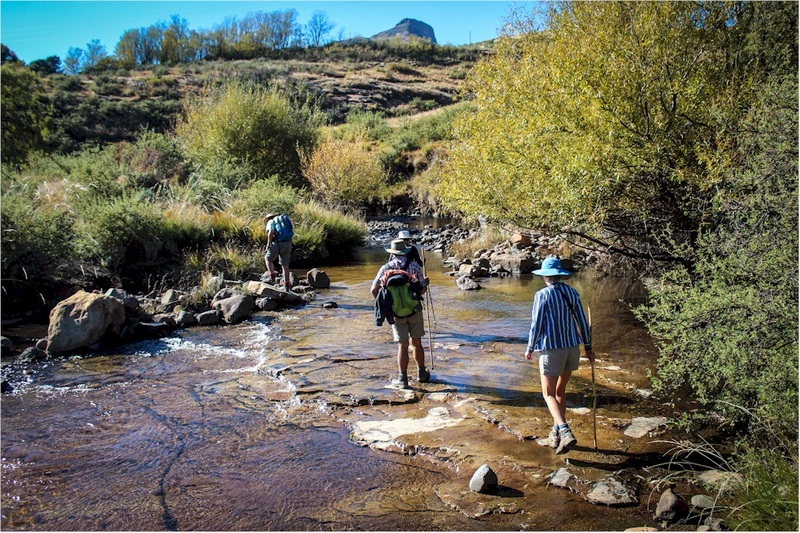 Love the idea of exploring the great outdoors on foot, but not keen on carrying a heavy backpack and camping in temperamental mountain weather ? The Wartrail farming community near Barkly East hosts The 4 – day Slack – Packing Skywalk; which is rapidly gaining renown for its pristine beauty, generous hospitality and memorable sightings. 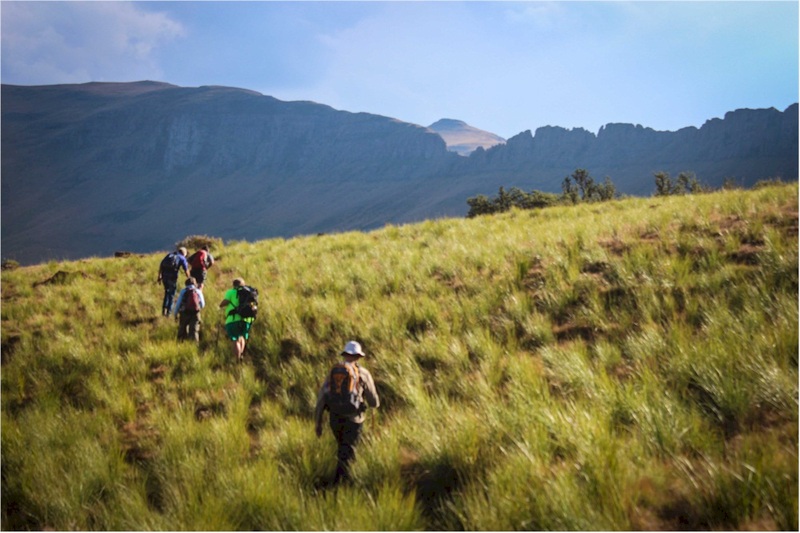 The hiking route traverses varied terrain, from farmland to veld, sandstone valleys to Basalt mountains, reaching altitudes of 2700m, revealing the splendour of the Southern Drakensberg. Your guide, Allan Isted, from Bidstone Cottages, is knowledgeable, sensitive and engaging; with a passion for sharing the territory with others. 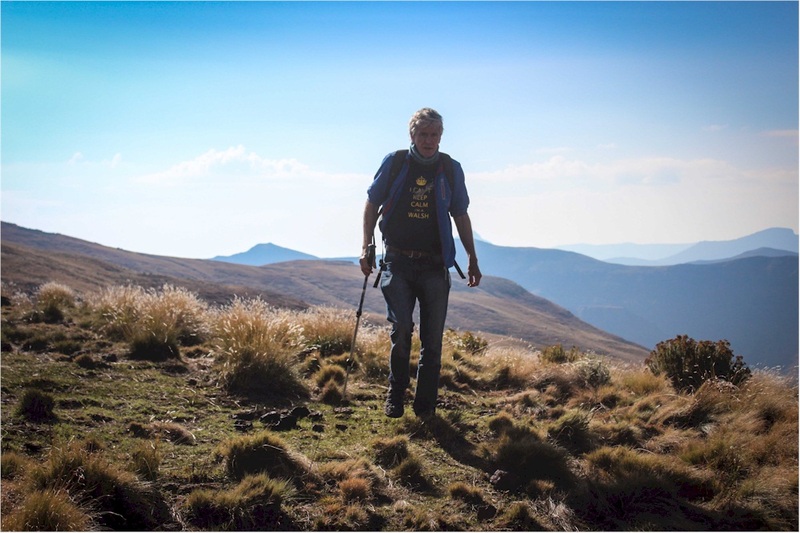 The hike through this untouched mountain range provides the opportunity to watch the majestic and rare Bearded Vulture, spy on shy Reedbuck and marvel at the variety of Alpine Flora. The district’s many sandstone overhangs reveal some of our country’s best rock art. Allan’s perceptive insights and enthusiasm gives each viewer their own intimate experience relating to this powerful social art form. Night 1 is spent at Glengyle with your hostess Debbie Roberson. Glengyle is one of the oldest farms in the district and has a magnificent English country garden and several acres of raspberry canes. Moira Sephton’s raspberry jam is legendary and sells like hot cakes! Night 2 is at Margie Frost’s Balloch guest farm. Willowstream cottage is nestled below towering sandstone formations where Bearded vultures nest. Balloch is a national heritage site and operates off the grid with a Hydro electric power system. On Night 3 you will be welcomed to Reedsdell Cottage where Kath Isted’s country cooking is heavenly after descending down “The Wall” into the Wildfell valley. Guests sleep and dine in a separate stone cottage with gorgeous views onto Halstone Kranz. The final 4th night is with Allan at Bidstone Cottages. The farm’s wood fired oven has made his gourmet Pizza nights famous throughout the district. The huge traditional Aga- heated kitchen and adjoining Leon’s pub provide the hub for guests to enjoy their last night together and reminisce over delicious pizza and a beer. Climate: A typical highland climate with moderate summers and cold winters. The area has summer rainfall with afternoon thunderstorms. 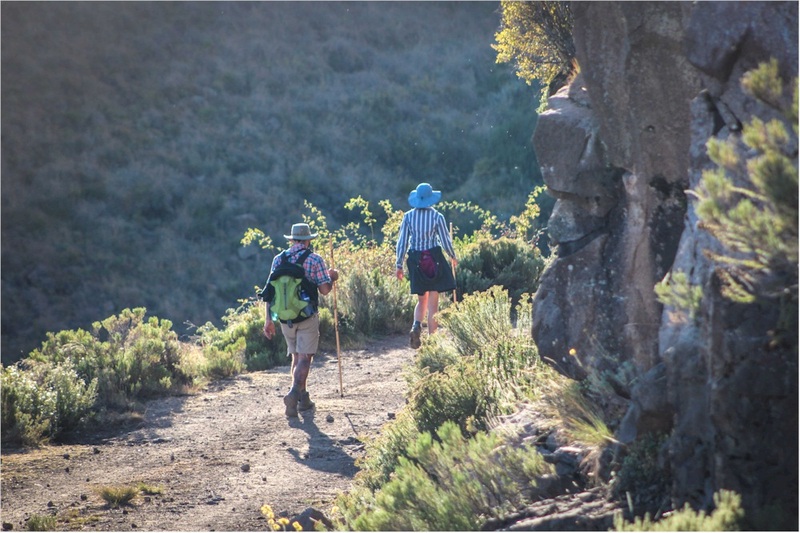 It is suggested that you start your trails early in the morning so that you have descended the mountain soon after lunchtime. The days are warm (28º – 30ºC) and the nights cool (a sweater will be needed). Medical conditions: When you book you must notify us of any medical conditions, medical history, or medications that you are on. In particular asthma, diabetes, heart conditions and allergies (especially to wasp/bee stings & any food allergies). Please advise us if you have a history of knee or ankle problems. What to bring: Our mountainous areas can experience extremely cold weather, even in summer. Warm clothes are essential. We insist you have the essential items below and reserve the right to make you purchase / hire them before the hike.